What a full, memorable and fantastic final day for Reach Cambridge Spring 2018! The day started with the final morning of subject classes. Highlights included Experimental Medicine in Life Sciences & Medicine, and Torus Equations (Donut equation) in Maths. The teachers said how much they had enjoyed teaching the students over the last few weeks and wished all the students luck for the future! Students then all walked back into town for the final time to grab some lunch. Then, the students were given three choices: (1) to visit the famous Fitzwilliam Museum – the museum was described by the Standing Commission on Museums & Galleries in 1968 as “one of the greatest art collections of the nation and a monument of the first importance” with their knowledgeable guide Kate, (2) punting on the River Cam or (3) some more time to explore the centre of Cambridge for some last minute souvenir-shopping etc. After this, all students congregated back at Reach Hall to give their presentations. These presentations were introduced and assigned in Tuesday’s Presentation Skills session with Precious. Presentations had to last 10 minutes max (including question time), and bring together all the skills and teaching from Precious’ workshop. The judges – led by our Director of Curriculum, Monika – were given marked in several areas including visual aids, dynamic audience participation, structure and content. 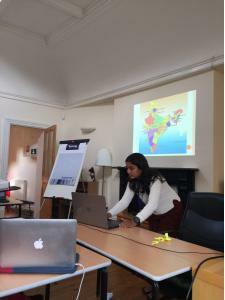 All of the presentations were engaging and informative, with a broad range of topics including Wolves, The Education systems in Japan and England, Driverless Cars and enlightening presentations on students’ home countries/towns including Australia, India and London. It was a joy to listen to them all! After this, students had a quick turnaround before heading down to a local restaurant for our final night dinner. We started with a mixed sharing starter of bruschetta, garlic bread and mixed salad, followed by some tasty mains. Dessert was the best yet to come…. Kate had created an epic ice cream party in the dining room including a wide variety of amazing toppings and sauces! The students loved it :)! The party atmosphere continued in the lounge with fairy lights, disco music and a photo slideshow of the last few weeks. There were then certificates handed out to everyone highlighting all they had achieved in their classes and in general over the last week. The evening then ended with Singstar karaoke and card games. It’s been an amazing few weeks and we can’t thank everyone enough for making it such an unforgettable programme. We wish all the students the very best for the future and hope to see them again in Cambridge soon!! !